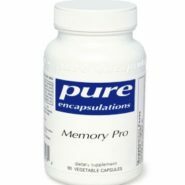 This formula combines acetyl–l–carnitine, phospholipids and herbal extracts to promote neural health, cognitive function and memory. Acetyl–l–carnitine serves as an acetyl donor to support healthy levels of acetylcholine, a key neurotransmitter in the brain. Phosphatidylserine is an important cell membrane component critical for neuron function and communication. Research suggests that it promotes healthy neurotransmitter levels and spatial memory. The Ayurvedic herb Bacopa monniera promotes memory as well as mental function and information processing. Ginkgo biloba and vinpocetine promote cerebral blood flow, vascular integrity and healthy red blood cell and platelet function in the brain. Curcumin, resveratrol and lemon balm extracts help to protect neurons from oxidative stress. In a recent study, Curcumin C3 Complex® helped maintain healthy tissue in the brain by supporting macrophage activity. The soothing properties of lemon balm are highlighted in one double blind, randomized, placebo-controlled trial, indicating that it promoted relaxation and cognitive function in elderly individuals.